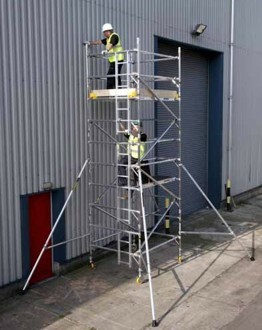 A range of 1.45m wide alloy towers supplied with castor wheels for easy, on-site mobility - the choice for the majority of decorating, maintenance and general building applications. Note: Specify platform size when ordering. Do not use access tower if the wind speed exceeds 17 mph. Tower heights are shown to platform. Allow 1 m for handrail height. Tower width measurements are taken from centre to centre of upright frames.